Last week I hosted a Preschool Educator Night at my library and we made felt stories that the teachers could take home with them. It was a big hit and I'd love to do another one sometime! I'm going to share with you what we did. First of all, I have to give mad props to my colleague J because she had all the felt-making know-how and her organization was really super helpful. I was all ready to jump into this on my own, but it wouldn't have turned out half so well if she hadn't been doing it with me. I also can't take credit for the idea. I swiped it from another librarian who presented the program at one of our Preschool Partnerships meetings. I started the program by demonstrating four felt stories - Dog's Colorful Day, Street Sounds, Five Little Pumpkins, and Bark, George! Each teacher could then pick two stories that they would like to make and take home with them. Teachers selected two patterns and the scripts that went with each. Then, while they cut out their patterns, J gave a brief tutorial on how she makes felts and different ways you can add details to make them pop. We provided all supplies (patterns, felt, tape, scissors, glue) and let the teachers select their felt and work on their stories. It was a great program and I think everyone got something out of it, but there are a few things I would change if we did it again. I had scheduled it from 7:00-8:00, but that wasn't enough time. I'd allow at least an hour and a half (and we actually ended up continuing the program until 8:30 anyway). We provided plastic baggies for them to take their stories home with them and if they weren't done working, they took the felt and patterns home to finish. Also, I think the program would have worked just as well (and been easier to plan) if we had just done one felt story instead of letting them pick two out of four. We could have prepped the felt more, which would have made for a more streamlined program. As it was, we didn't know which stories everyone would pick and we hesitated to cut the felt beforehand, not knowing how much would be used. 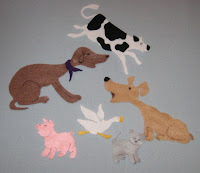 We did have a bit of a crunch cutting out appropriately sized pieces when everyone came up to get their felt. Also, we probably could have fit the program into one hour if we had just done one felt story. Something to think about with this program is the labor and cost... J spent several weeks before the program creating patterns and figuring out how much felt we would need. We also ordered more scissors because we didn't have a huge supply of adult-sized scissors (although we have plenty of kid-sized scissors!). So that's something to think about. I think it was worth the cost, but using just one felt story would have cut way down on the labor (and somewhat on the cost... we still would have needed scissors, but we would have had a better idea about what felt we would need). Also, check with your State Department of Education to see if you can provide CPDU's for the program. We offered CPDU's for the Every Child Ready to Read program last winter, but I didn't think this would count. I still had a bunch of teachers asking, so it would have been worth it to try and register the program. This is a great explanation! I wanted to see if you knew about Story Time Felts, they make felt figures you can cut out and put together at your make and takes, and it would save some work. You could preregister people who prepay and then do your talk while they cut them out. Sometimes I also have them make little lapboard felt boards as well. Have fun! Thanks for sharing the educational post. In the event that you need to pick up data in the field of the business, you should peruse the life of Thompson. This homepage is so great and increases much data about the life of the Thompson. Excellent post for the students. Like an instructor enabling making sense of how to a get-together of youngsters, you would click here be viewed as gainful in playing out your activity well in the event that you can change their unfilled characters into open angles. Good blog post, You need to pick your field and pass on each and everything about this field. I revere this helpful hints and some fundamental things you say in this article which will display useful. You are doing a good job.